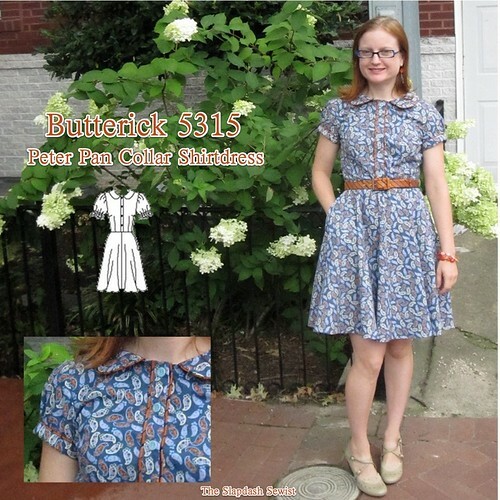 Butterick 5315 has been on my list for quite a while. 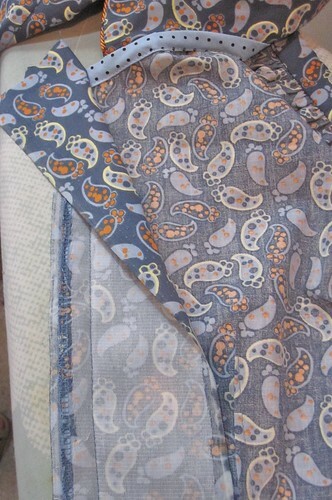 I bought this fabric from G Street's special cottons table in March 2010 for $5.88/yd. I know I paired it with this orange tie silk at the time (the tie silk is from a bundle I split with Cidell in 2008), but I can't remember if I chose the pattern then or shortly after. At any rate, I've been planning to make this for two years, if not a little longer. In fact, I waited long enough that the pattern is now out of print. Sometimes it's obvious why a pattern went out of print, but this is actually (relatively) well-drafted with nice details that aren't too trendy. I don't know why they took this one off the market. 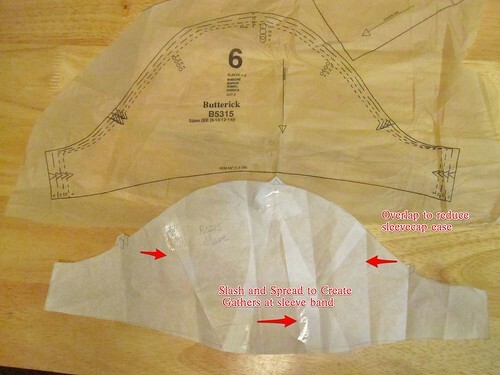 -Front placket method from Silhouette patterns as pointed out by Dana of Lean Mean Sewing Machine. -Side zipper with pocket technique from Simplicity 2497 (shown at right). If you have access to Simplicity sales, I think it's worth picking up this pattern solely for those instructions. So my vision was piping. I wanted to pipe the collar, the placket, the back yoke, and sleeve bands. Some of this required redrafting, in addition to my usual Broad Back (remember to add width to both the back bodice *and* the yoke), Small Bust, and Swayback adjustments. I took the provided cap sleeve and slashed it up the center, spreading to add volume to gather up at the hem. I also overlapped at the front and back sleevecap to reduce the ease. I know we all complain about this all the time, but they really do put a LOT of ease into a sleevecap in the Big 4. This is drafted with a cut on placket. Since I wanted to pipe the placket I had to add a separate placket. The Silhouette method is to create a placket that encases a placket extension on the bodice, rather than being entirely separate. In the end, I'm not sure this was the right choice as I have difficulty buttoning the top button because of all the bulk in the buttonhole, but it worked out fine. To make the piping I bias-cut my tie silk 1 5/8 inch wide, so that when folded over the cording it would be 5/8 wide, the width of my seam allowances. I used the continuous bias strip method to sew and cut it. For cording, I just used whatever rattail braid I had in stash. 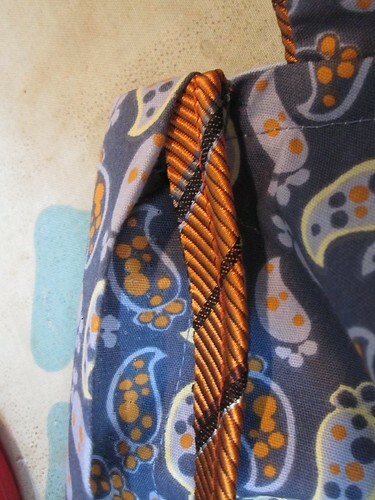 I used my zipper foot to stitch the braid into the bias. The issue with piping, other than just being a general pain in the @ss, is the bulk at the seam allowances. The trick here is that once you have cut your piping to size for your seam, you pull the cording out and cut an inch or so off. That way the piping is flat in the seam allowance. The biggest challenge with the placket was finishing the top edge. The collar on this dress is a standless Peter Pan shape that does not extend all the way to the edge of the neckline. Instead, the last inch and a half of the neckline is finished with the placket. 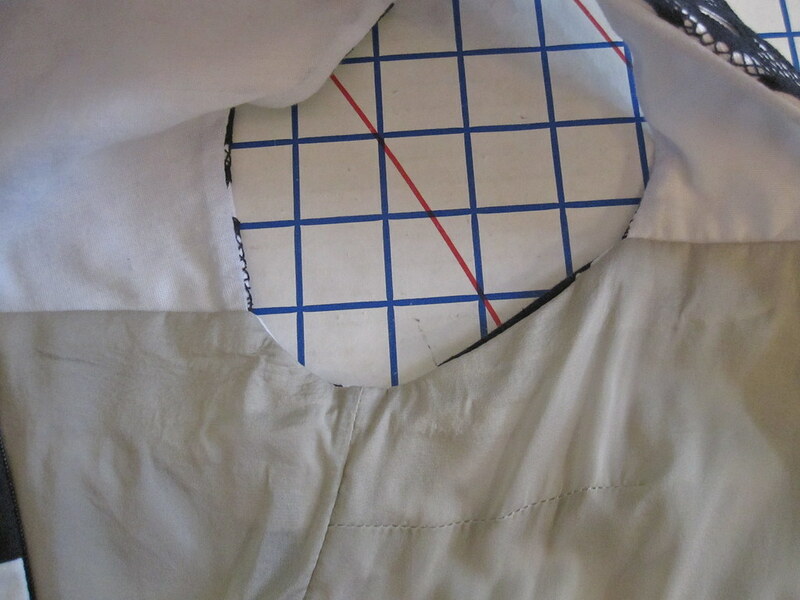 I first applied the placket to the inside of the bodice, right side of placket to wrong side of fabric. Next, fold the placket the long way down the center, right sides together. Fold the outer edge of the placket's seam allowance over this. 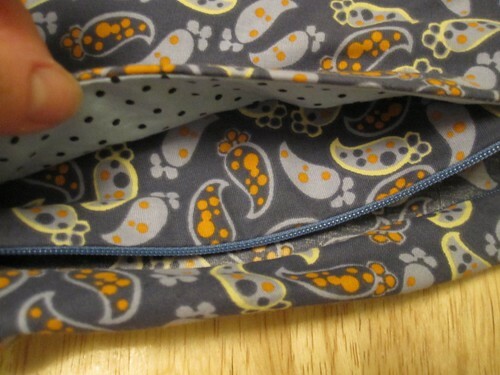 Then place the piping on top of the folded-out seam allowance. 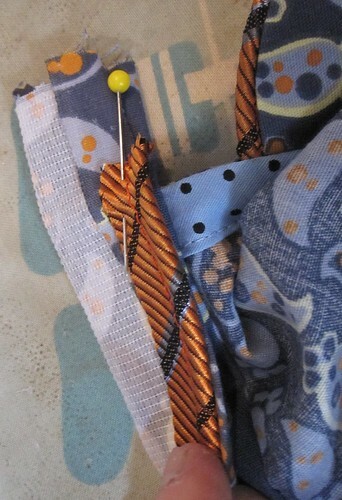 Pin this whole mess together above the neckline, which has been finished with bias tape before attaching the placket. 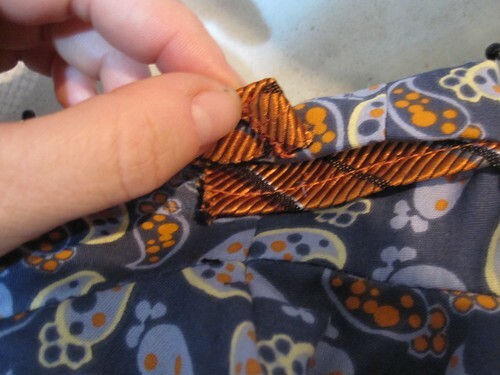 Stitch right above the finished neckline edge, catching all layers of the placket. Trim very close to the stitching. If you are me you will also zigzag, because I have a weird fanaticism and phobia about raw edges. 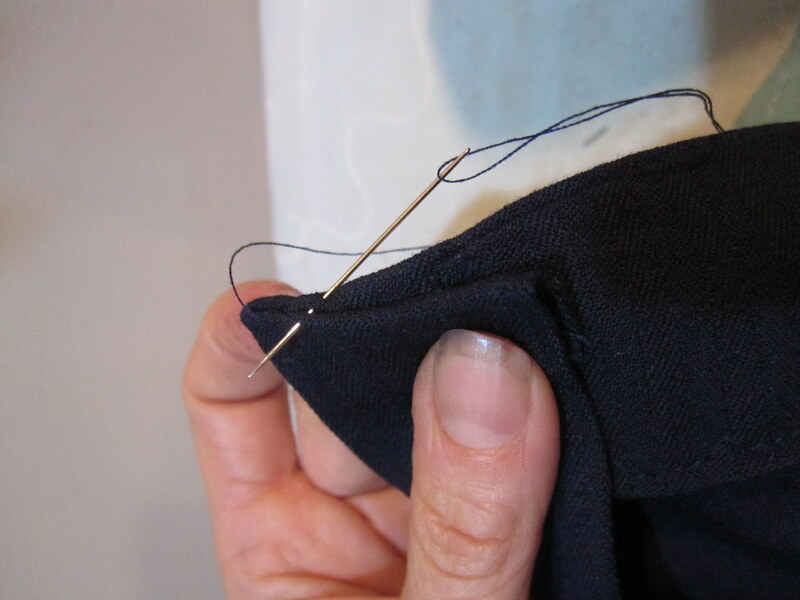 Now fold the placket over to the front, encasing that upper seam. Pin in place, positioning the piping. Topstitch the placket close to the edge and piping. I used essentially the same method for the sleeve. 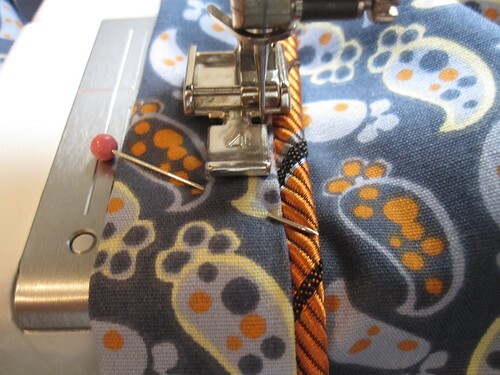 I originally cut the sleeve band with two inches of ease above my bicep measurement but when I finished it, I was just afraid that it was too tight--the tie silk for my piping fabric is quite thick and added a lot of bulk. 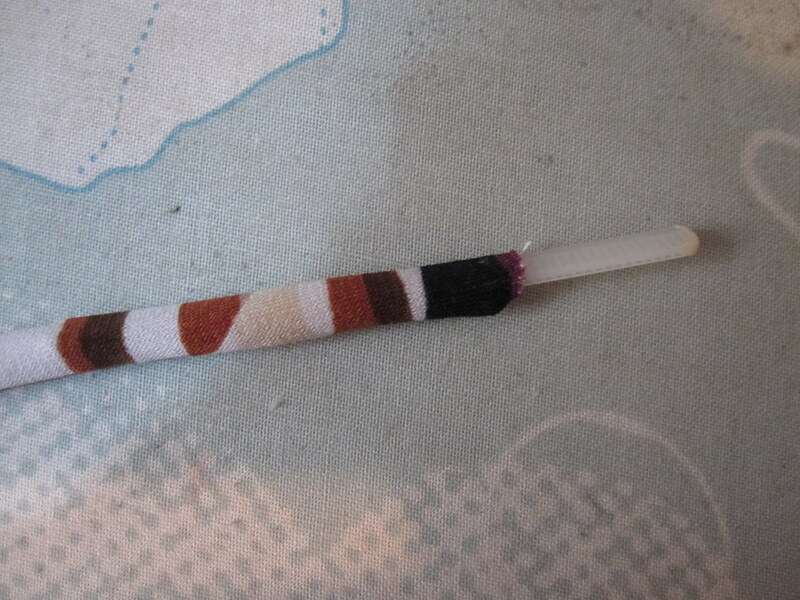 So I had to rip it off and add another inch to the sleeve band. In the end, I think it was more the nature of cap sleeves and a slightly restricted back (despite my broad back adjustment!) but I would have been so annoyed with myself had I left the sleeve band as is and felt uncomfortable in the dress. For the sleeve band, I stitched it first to the inside of the sleeve, then folded it over to the front and topstitched with the piping in place. 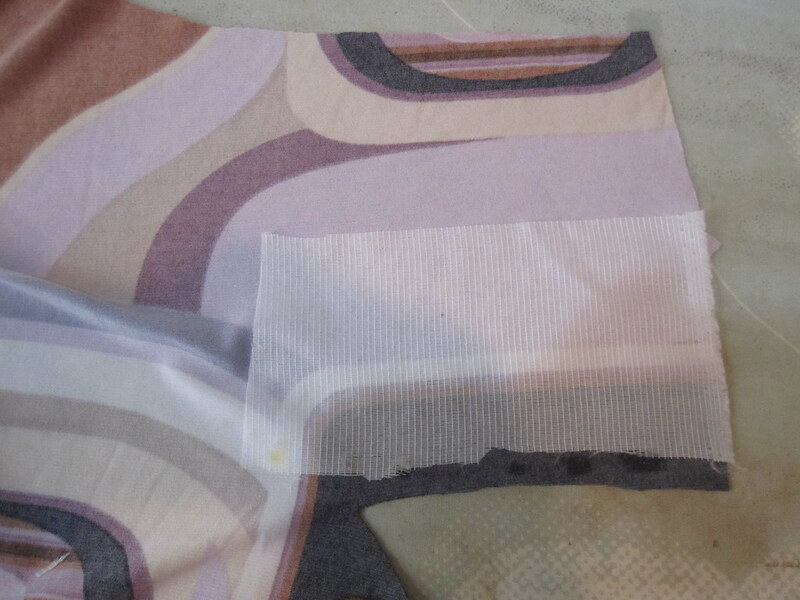 To reduce bulk, at the underarm seam I cut the piping so that it would overlap by about 1 inch. I also trimmed the piping's seam allowance. I fray-checked the cut edges of the piping. I placed the lower layer of piping straight and then folded over the upper layer of piping 3/8 inch or so and then placed that on top. This was much less bulk than trying to stitch the piping right sides together and having a seam allowance there. Because of limited fabric, I had to shorten the skirt. I wish I'd had just one more inch--I feel that the length makes this more Sally Draper than Betty Draper when combined with the Peter Pan collar. To preserve as much length as possible, I did a machine rolled hem. I find it easier to do this by the panel, rather than try to roll the hem over the seam allowances, so I opened out the seams for a couple inches above the hem. 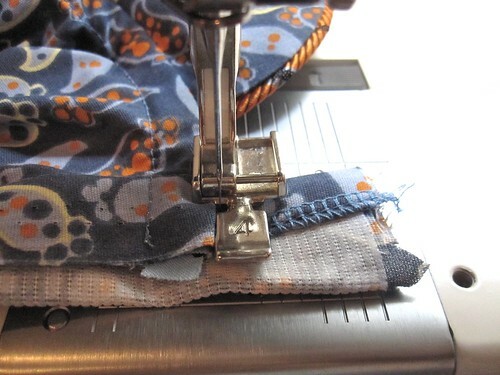 There is a trick to using a machine rolled hem foot, and I'm not entirely sure what it is, LOL. I have worked out my own method. The first thing is to zigzag the edges of the fabric. I find this necessary to get the foot to grab onto the edge of the fabric. Serging would be too wide and bulky here, so it's good ol' zigzag for me. My method is to start by manually rolling the beginning of the hem in a double roll, about as wide as the foot will roll the hem. Place this manual roll under the foot and put in about 4 or 5 stitches. 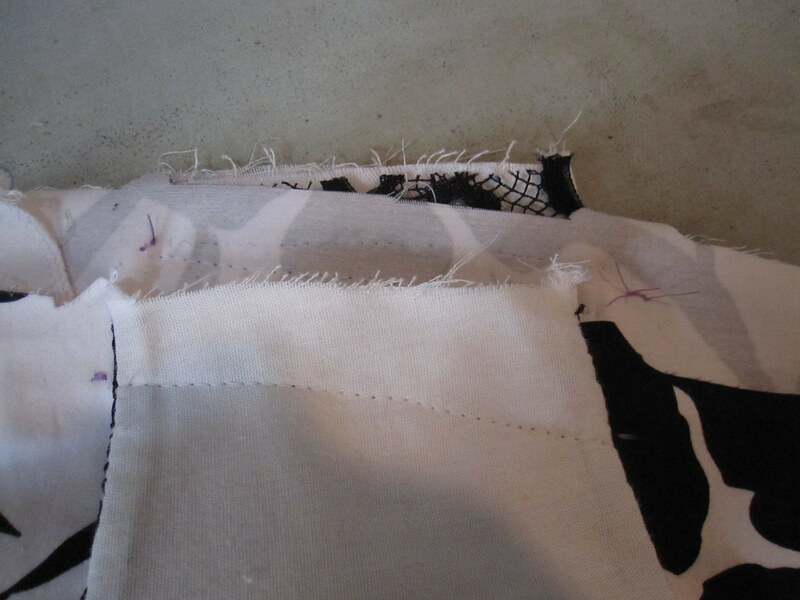 This is the hardest part because my machine's feed dogs just don't play well with the rolled hem foot. It is very hard to get the fabric to run through the machine rather than just bunching and making infinite stitches in the same place. I find I have to be very proactive in pulling the fabric through the machine, even when past the beginning the stage. I don't know if that's common or normal. 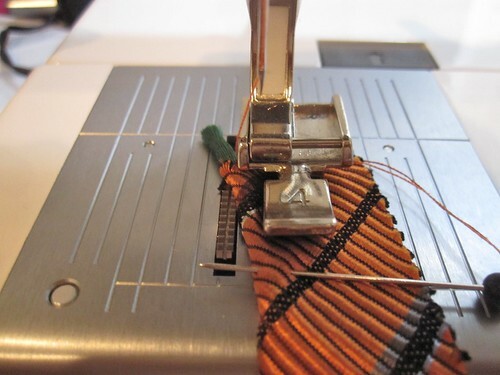 After you have secured your manual roll with a few stitches, with the needle down in the fabric, lift the foot. 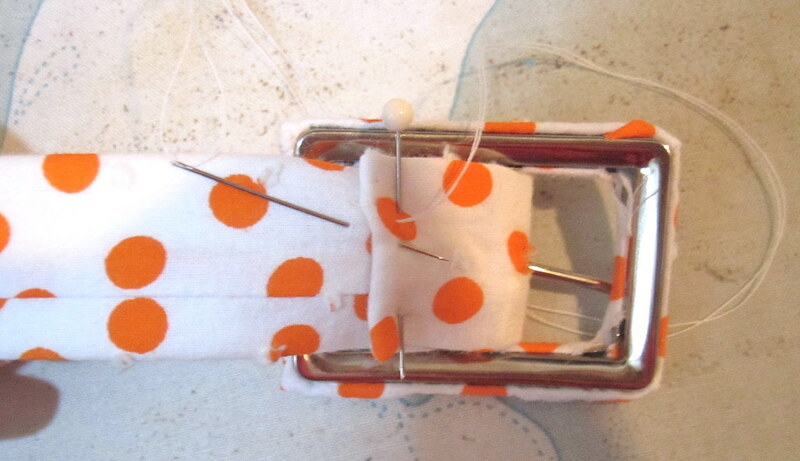 Then pull the fabric up into the foot, working it into the roll. Lower the foot and then continue stitching. Your manual roll and whatever bobble may occur at the beginning of the machine roll should be hidden in the seam allowance. As I said in my last post (which has information on making a covered belt), I am now totally into the matching belt situation. I ordered from Sunni of A Fashionable Stitch and was very happy with her selection, prices, and especially her quick shipping. This is definitely not her fault, but the covered buckles being manufactured nowadays are much flimsier than the vintage one I used. It still seems ok, though. I put in brass eyelets because I felt they would match the orange better, without thinking about the fact that the hook on the belt is silver. Ugh! 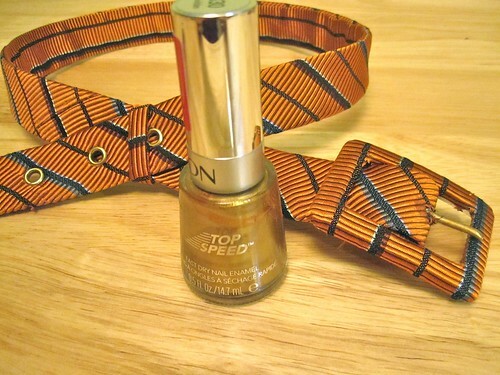 I painted it with gold nail polish and that seemed to work well enough. July was Pattern Review's Pattern Stash Contest. I chose this pattern because, as mentioned, I've been planning it forever. I kept putting it off because I knew it would be a lot of work with a lot of fussy details and I was definitely not wrong. I worked on this dress for three weeks, although I had very little sewing time over that period. The pattern adjustments and drafting the additional pieces alone took about 2 hours, then the cutting layout took forever because of limited fabric, and then sewing with piping just takes extra time and effort. But, the dress is really cute and I'm sure eventually I'll forget how much work it was! I dragooned a photographer into taking outdoor shots because I am fancy. Thank you for all your support on the last post! I promise it was not my intention to post a rant and then disappear for a week, but I had family in town last week and then lost all of my photos for the past 3 years when my Mac's hard drive was replaced. Yes, I had backed up with Time Machine. But for some reason the one thing Time Machine didn't copy was my iPhoto library. It was pretty devastating. Luckily, I have a lot of things on flickr. Anyway, I am aware of the irony that I am wearing a bit of a heel in these photos! I really appreciated Ripple Dandelion's comment that it is important for at least some of us to model healthy footwear. Our eyes are very trained to see only super high heels as attractive, because that's all we see in magazines and red carpets. By wearing healthy shoes in our photos, I do feel that we can offer a small counter-message. The heels in these photos are low and supportive, I promise! And there will be many more Danskos to come. Heh. One of the things I did for my Seersucker Social outfit was to make a matching belt for the first time. I am so hooked! I used a vintage belt kit that I got in a big bag of random sewing crap at the thrift store. 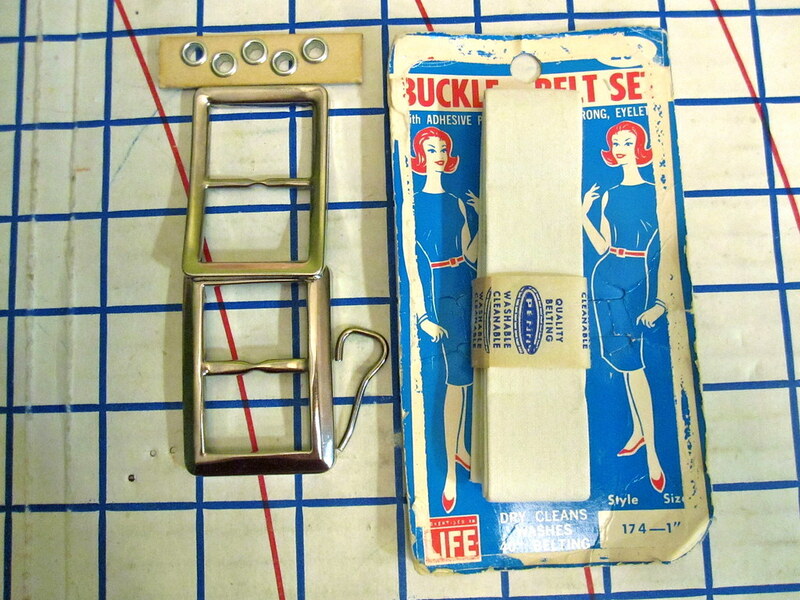 The kit contained belting, a two piece coverable belt buckle, a hook for the buckle, and even the eyelets for the belt. I started by interfacing the fabric for the buckle. I was using a bit of lightweight and fairly sheer swiss dot batiste (purchased in Vietnam and made into McCall 5426). The interfacing gave it a little more heft and opacity. 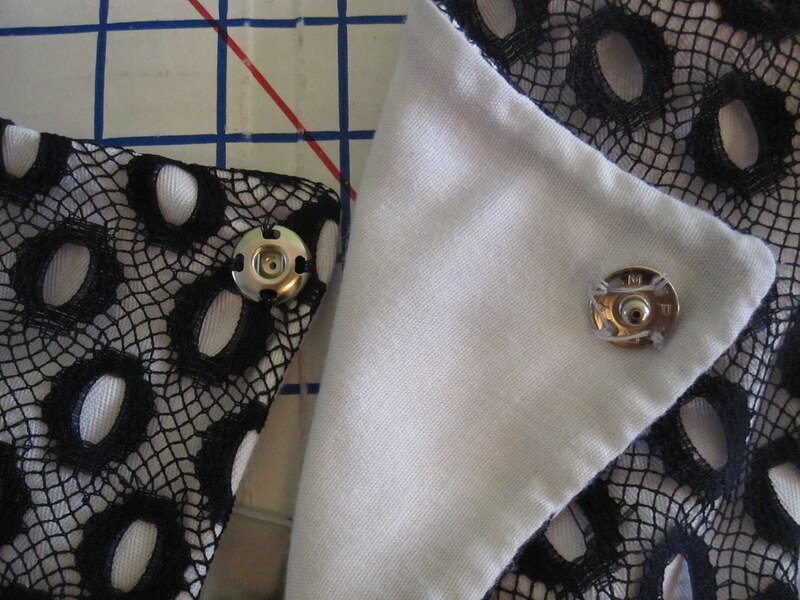 I placed the top part of the buckle on the interfaced side of the fabric and traced the holes. Next, I cut x-es into the corners, so I could fold the fabric up into the belt buckle. 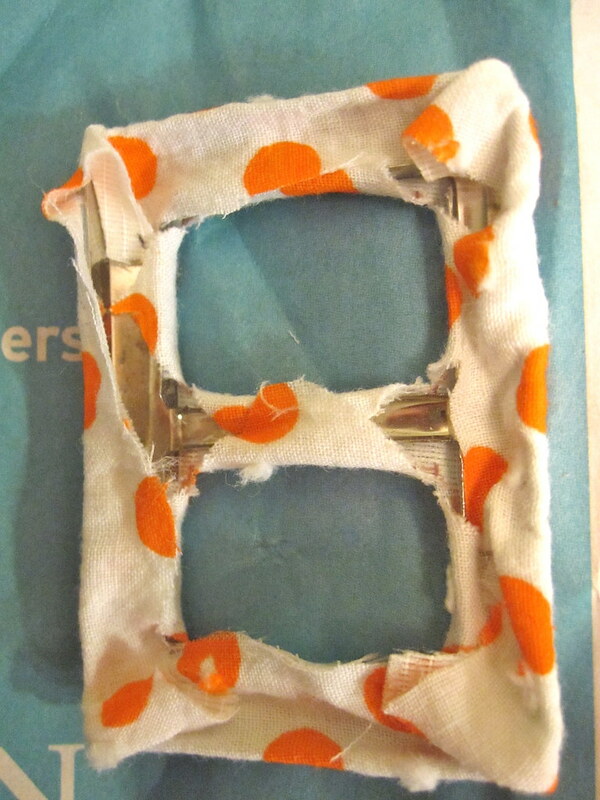 The only thing missing from my vintage kit was the piece of adhesive used to glue the fabric to the buckle. I used a spray adhesive instead. 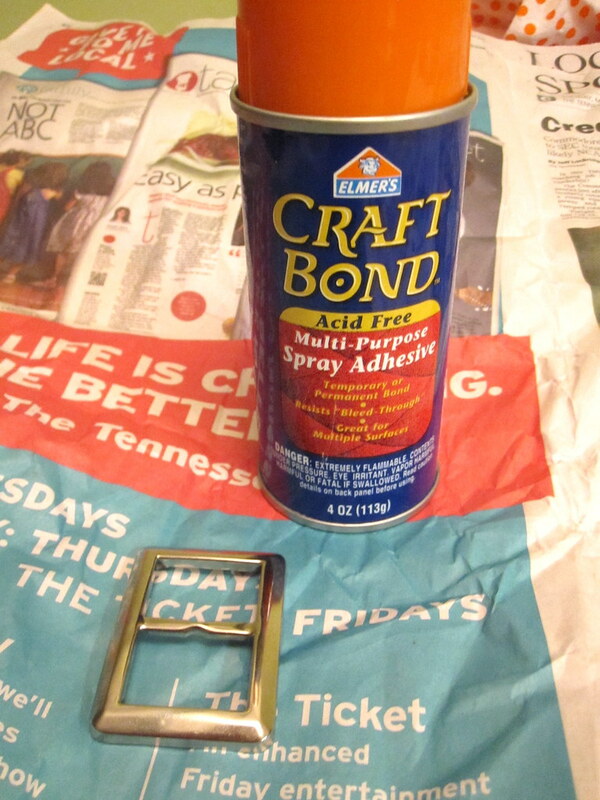 Once you've sprayed your belt buckle with adhesive, place it onto the interfacing side of the fabric and then fold the fabric into place over the buckle. It doesn't have to beautiful inside the channels. This was my first time, so I will admit it's definitely not the best job (it looks fine from the front). Next time I will clip deeper into the corners. 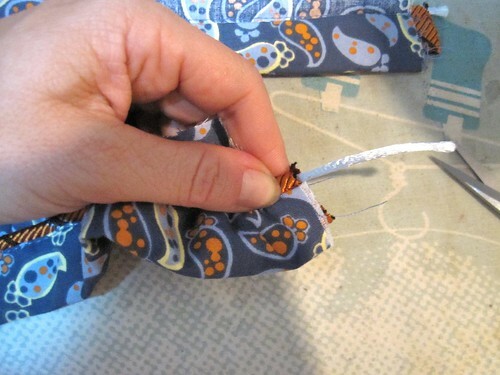 Trim off any excess fabric that can't comfortably fit inside the channels. When the front of the buckle is covered, you snap the back part of the buckle in place. 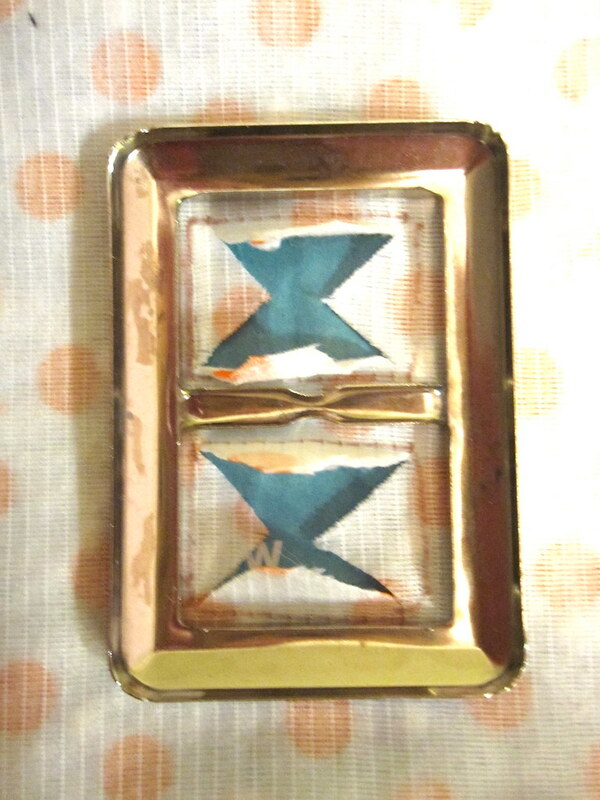 Before covering the buckle, I was concerned about the two pieces staying together. The back part of the buckle is significantly smaller than the front, and when the front is uncovered the two don't stay together at all. When the front's channels are filled with fabric, however, the back snaps and stays in place because of the tension. 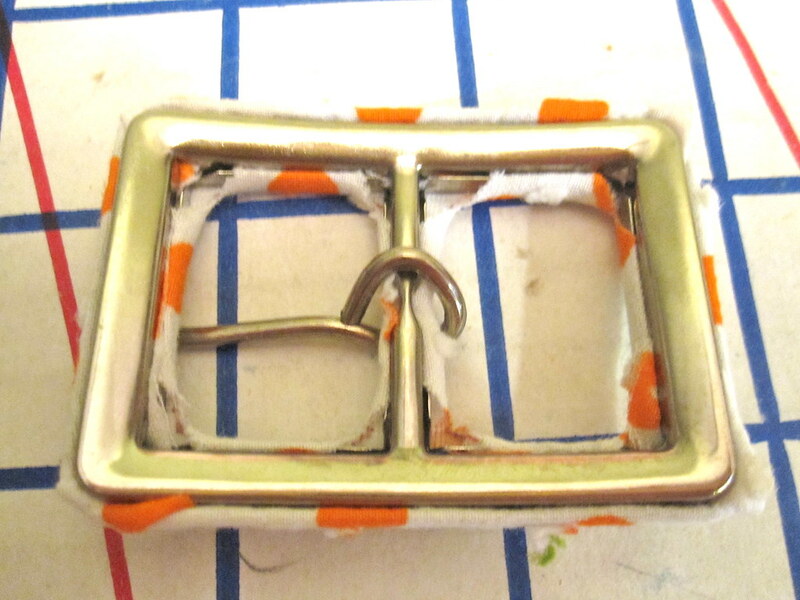 Use pliers to close the loop that holds the hook on the buckle. To cover the belt itself I followed this tutorial. I used my eyelet setter tool to punch a hole for the hook to go through. The last two inches of the belt do not have belting--I punched the hole about 1/2 inch from the end of where the belting is. I used fray check on the hole. The recommendation on the packaging was to use an eyelet for the hook, but this seemed bulky and made it harder to buckle the belt. 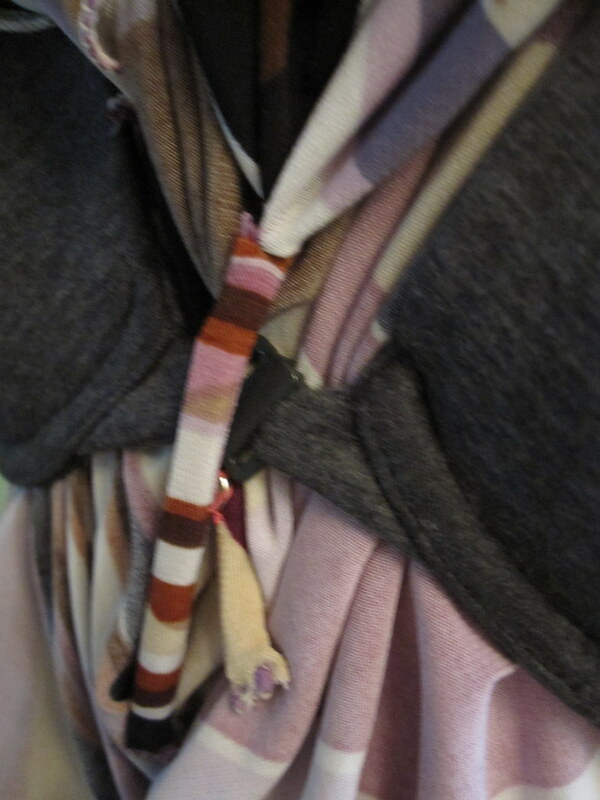 I folded over the part of the fabric belt that did not have belting in it and hand stitched it in place. My sewing goody bag also came with a set of vintage eyelets. I have an eyelet setter gun type thing, but this set came with the tools you use with a hammer. One of the tools was a cutter, and it cut larger holes than my eyelet setter (which punches holes, rather than cutting them). 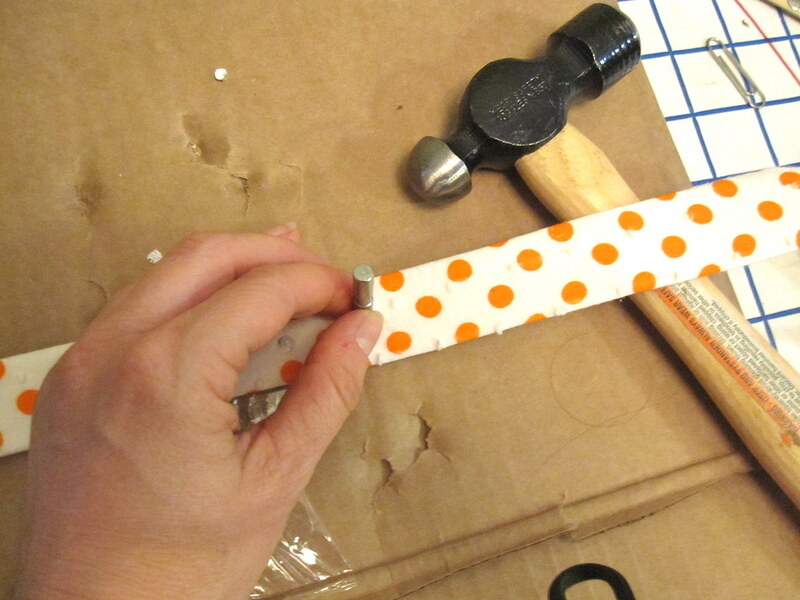 I found that with the belting, I needed the larger holes. Using a piece of cardboard to protect the table and a lot of hammering, I used the cutter tool and hammer to cut my marked holes for the eyelets for fastening the belt. I used Fray Check on the holes, just because I'm paranoid like that. 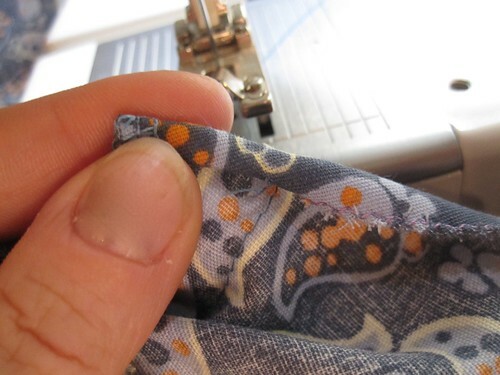 There is an art to inserting eyelets with the gun-type eyelet-setter tool. If you don't do it exactly right, the back of your eyelet just crumples and it doesn't set properly. 1. Punch the hole first. 2. 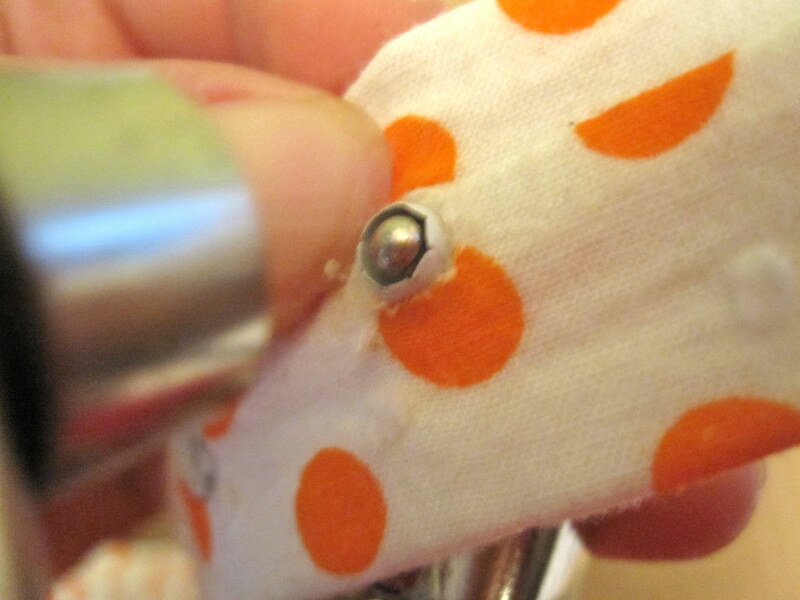 Place the eyelet into the hole and (very important) snug the fabric down to the base of the eyelet. You must be able to see the neck of the eyelet all the way around. The photo at right illustrates how far down the eyelet neck you must snug. 3. 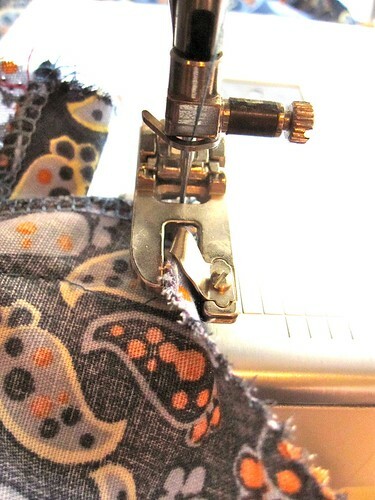 Put the stalk of the eyelet gun through the eyelet and recheck your snugging. 4. Now you can squeeze the gun and set your eyelet. 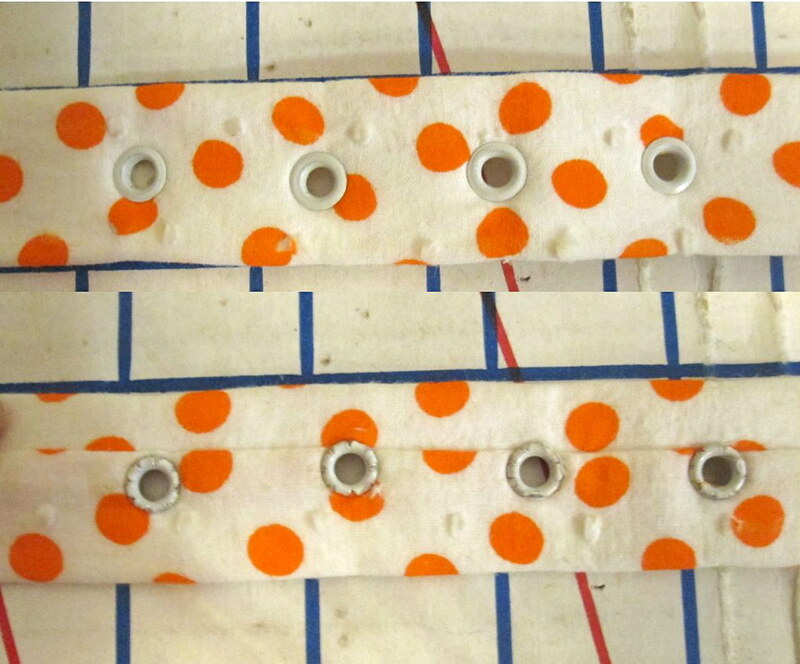 If you do not do the pre-punched hole and the super duper extra triple check snugging, your eyelet will mess up. 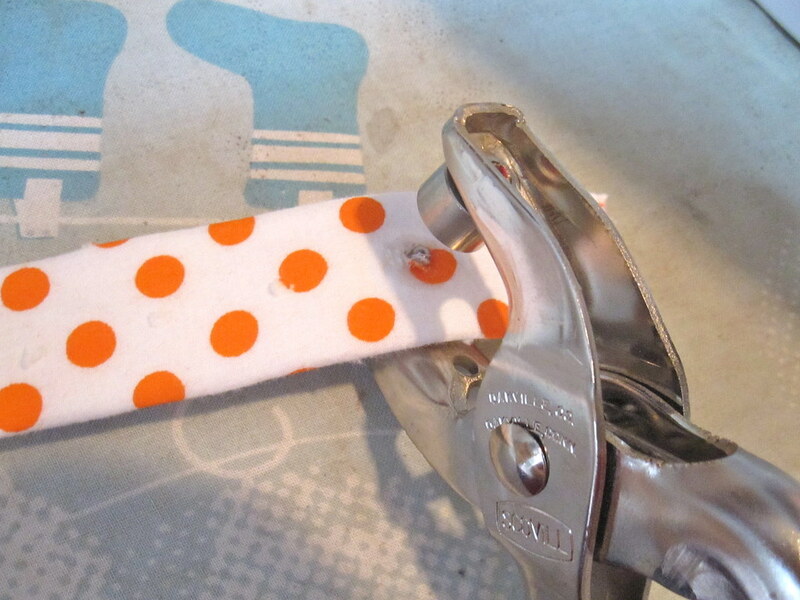 If you do it as described, 90% of your eyelets will go in perfectly. I have not found any way to avoid the other 10%. Luckily, all of my eyelets went in perfectly. Phew! Love the little touch that the belt added! I am now totally into the idea of making more. I had never seen any covered belt kits except vintage ones but they are still made! Most are by a company called Maxant and are available from a variety of sources (google "Maxant Buckle Kit"). I plan to order some soon from here, but I haven't used them before so can't recommend the store yet. YOU CAN PRY MY DANSKOS OFF MY COLD DEAD FEET. I have crappy feet. They are completely flat, I have tendinitis in my right foot, and they are unusually tender and unpadded. I also have injury-prone calves. It was only after I discovered Danskos (and I have tried other brands; Danskos are best for me) that I realized it was possible for your feet not to hurt all the time. I don't have a car. My feet are the way I get myself around. Not to mention the fact that I am athletic, some might say to the point of fanatical. Being able to put in a hard workout (or two, most days) is very important to my well-being. Both of these things require that my crappy feet are in the best possible condition at all times. Exchanging my transportation and my mental health for cute shoes is not an option. I am sorry if my ability to walk for miles every day offends you. But I am not going to endanger my health and my ability to remain active for as long as possible to satisfy your aesthetic standards. In fact, I'm not willing to accept even the smallest amount of pain to satisfy your aesthetic standards. Choosing pain when there is a pain-free solution strikes me as foolish. I am willing to endure occasional discomfort in the name of fashion, but discomfort is *not* the same thing as pain. Future comments regarding my shoes will be deleted. In fact, I'm going to declare a new policy. All inexplicably critical future comments, particularly those left anonymously (someone took issue with my ironing recently--what???? ), will be deleted. They are annoying and upsetting, appear to be increasing in frequency, and I no longer feel obligated to let them stand. It's nothing I would *ever* do, so why should I let it be done to me? I love me a cowl neck, so when I saw Burda 08-2011-116 I knew I had to try it. Several months ago I sat with Cidell while she cleaned up her sewing area (sometimes you just need company). I came home with quite a haul, including this knit. It's not something I would have picked out for myself because the neutral color is brown and I just.don't.wear.brown. But I really love the colors in it and was itching to make it up. I didn't have enough fabric to lay out the front and back as single pieces, so I cut it at the waist and added an elasticated waistband (I was going to need some waist definition no matter how it was cut). This turned out to be fortuitous. 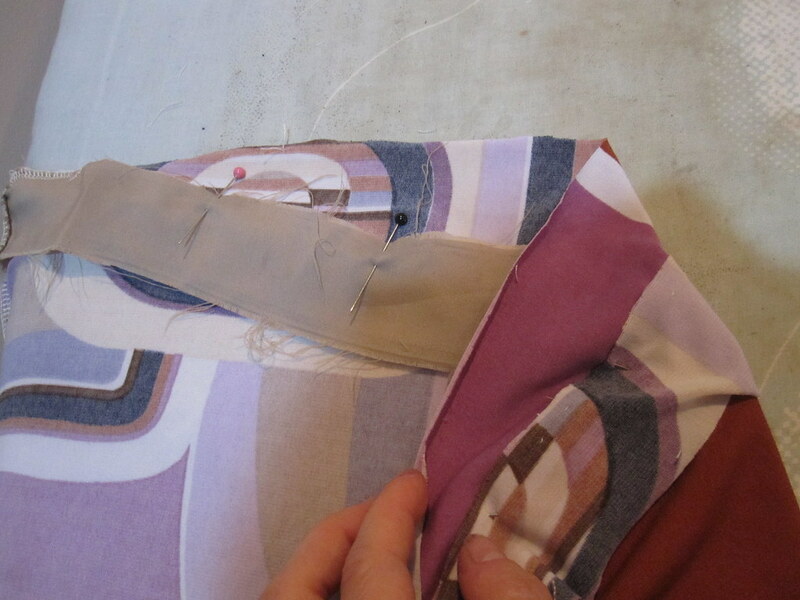 To make sure I got a good shape at the back collar, I interfaced it before stitching. The back collar is cut onto the front piece so be sure not to extend into the front cowl. You don't want a stiff cowl! The challenge with a cowl is to find the fine line between skimpy and ginormous. Burda crossed that line, and then went all the way around the earth and crossed it again. The cowl on this thing is just huge. I don't know what it would look like one me without the waistband, but you can see all that extra fabric drooping down over it. It was too late to do anything about it at the neckline, but it was not too late to save my waistline from total obscurity. And then there was this monstrosity. Pattern twinning is my nemesis. I don't even understand how it happens, I only know that it happens to me all the time. So I ripped out a whooooole lot of serging (it was a multi-day project), taking the front bodice off the waistband and removing the skirt from the lower edge of the waistband entirely. I re-attached the front bodice to the waistband, shortening by about 1 3/4 inches at the center, tapering to nothing at the side. I moved the skirt seam (the skirt is a tube with one seam in it) to the side, where the twinning would be less noticeable. The before and after isn't majorly striking, but I do think you can see a difference in how much fabric is puddling in the front and my waist is visible. Now came the question of how to keep the cowl in place. I have heard of commercial cowl tops putting a little weight into the cowl facing that you tuck under the center bridge of your bra to keep the cowl neatly in place. So I went with that idea. I thought that boning inserted into a casing and tucked under the bra might do the trick. I use cable ties for boning--much cheaper and not all curled up like plastic boning from Joann. Just cut off a piece of a suitable size. 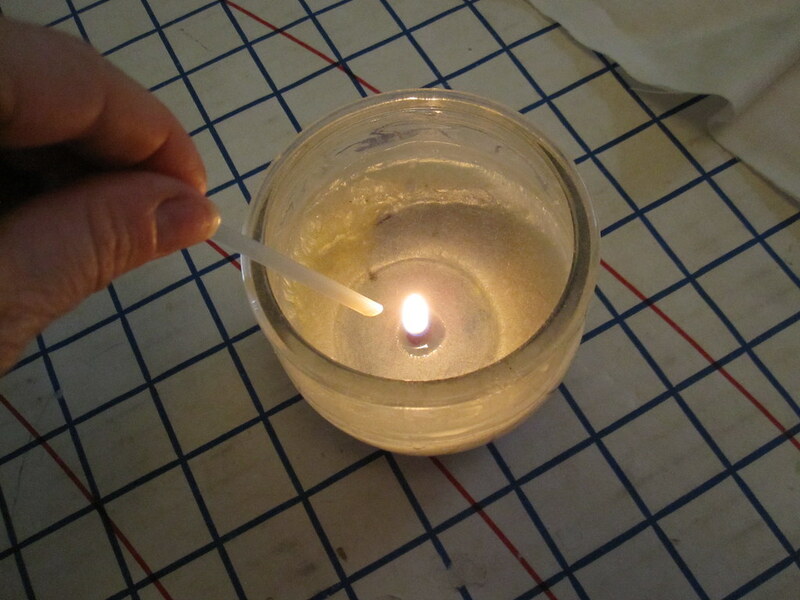 Plastic boning and cable ties alike are very sharp when cut; I find the easiest way to smooth the sharp edges is melting them with a candle. Once the edges were smoothed, I inserted the boning into a little channel I'd made. For this particular dress, I found that one attachment point at the center was not going to be enough to keep the cowl in place. Through experimention, I found that two sticks placed as pictured were good to keep people from being able to peer directly into my top. I wore it with the sticks tucked in the first time and they were a good idea and on the right track, but completely ineffective. I realized I needed some way to keep them firmly in place. So I sewed a snap on them. I apologize for the blurry picture, but you get the idea. One stick goes in front, one in back, and you snap them together below the bra. It really works a treat! As you can see here, even with the giant cowl there is no gape. I am pretty sure this is the first and only time I'll say this, but I think McCall 6069 is a better pattern for me in this style. *gasp* Who would have thought it of the Big 4? I really like the back collar and cut-on sleeve detail of the Burda, but hooboy the fit is a problem. I need to eventually compare the pattern pieces and see if I can come up with an acceptable hybrid. This dress is the trendy trifecta of the moment: colorblocking, lace, and back interest, oh my! I got the floral print at London Textiles during PR Weekend 2010 in Philadelphia. They were selling remnants for $3/yd. This was a not one yard piece. I wanted to use this fabric for the one yard challenge, but I just couldn't eke a skirt out of it. It was a scant 42 inches wide and one of the selvages had a big hole in it that took it to about 40 inches wide, just too narrow to get a skirt out of. The fabric is too heavy for a top, so I actually put it into the giveaway bag. I thought it was just as well because I wouldn't have a top to go with the skirt anyway. 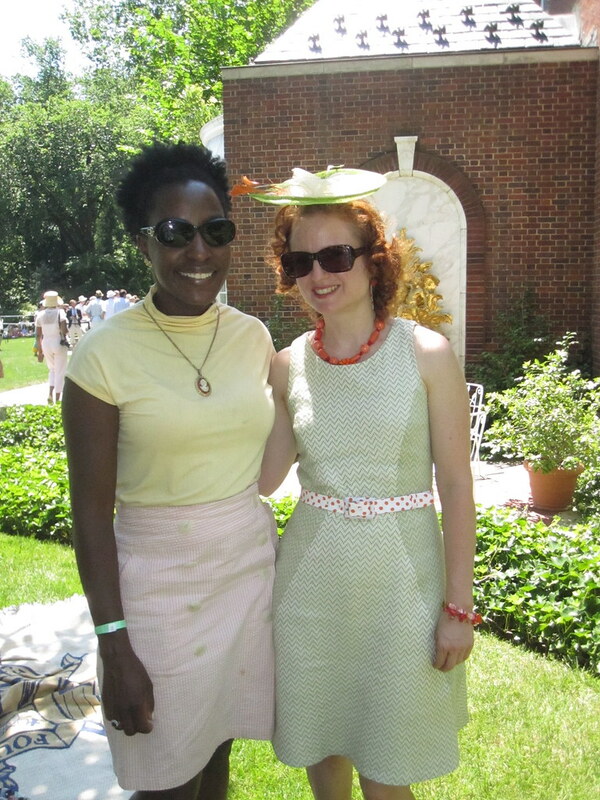 Then I was suddenly inspired by/jealous of Cidell's Sailabration outfits to use it for a colorblocked dress. With lace such a big trend right now I had been wanting to work lace into a garment and voila! The lace is from Jomar in Philly; I've already used it in a dress and a skirt. 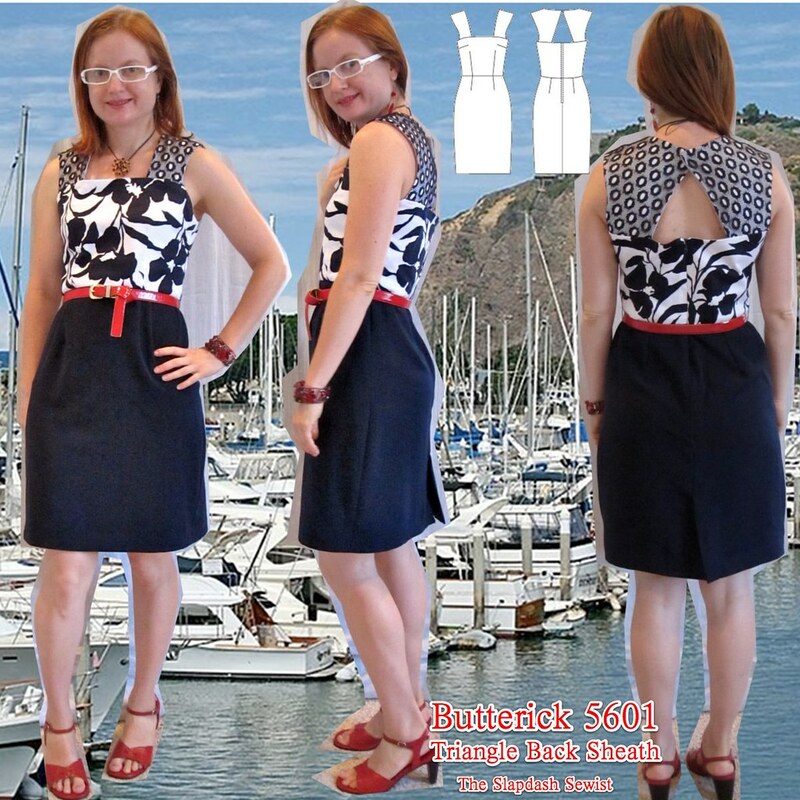 I was drawn to Butterick 5601 because of the simple shape with the back surprise. Although my taste runs to all the subtlety of a circus tent, I do like a simple piece with just one wow factor. From a design perspective I'm surprised this pattern has so few reviews, though having made it up I can say that perhaps it's a mercy. Like a lot of Big 4 patterns, it has some not-great drafting. The shape of the upper front bodice is just unnecessary. 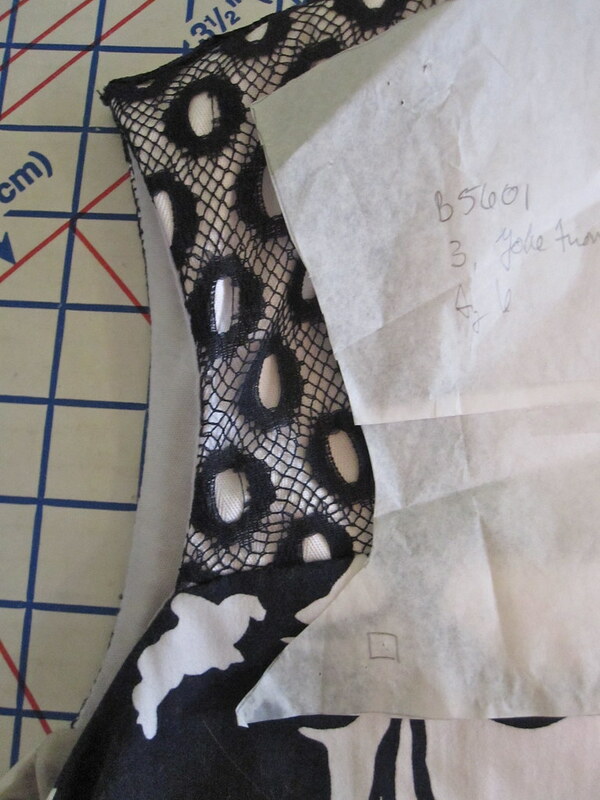 Look at that sharp curve and the long point on the pattern piece, and compare it with how much survives after the seam allowance is taken up. It's just sloppy drafting. The bodice is cut straight across the neckline from front to back, meaning it sits really, really high under the arms as drafted (as you can see at right). That is just asking for yellow armpit stains, not to mention the discomfort. When I sewed the lining in place I just dipped down between the front and back strap attachment lines. I lowered the armscye about an inch, and there is still more than an inch of fabric above my bra band. 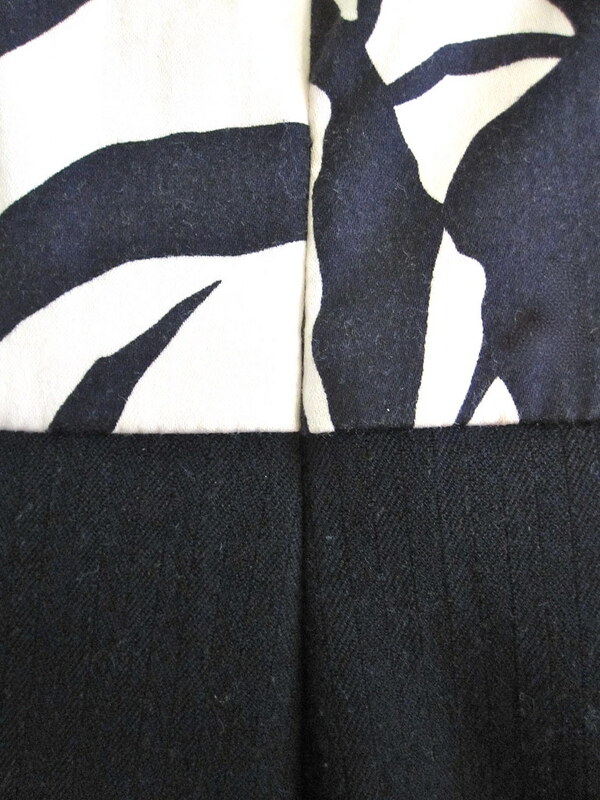 The diagonal center line of the back strap was gaping when I pinned the dress together, which I expected. As a crude fix, I placed the center of the back straps beyond the upper edge of the bodice when stitching it in place, thereby shortening the back strap at the center, tapering to nothing at the side. In the front, I placed the front shoulder straps closer to center front than marked due to my narrow shoulders. I can't say that the straight neckline is the most flattering to my small bust. 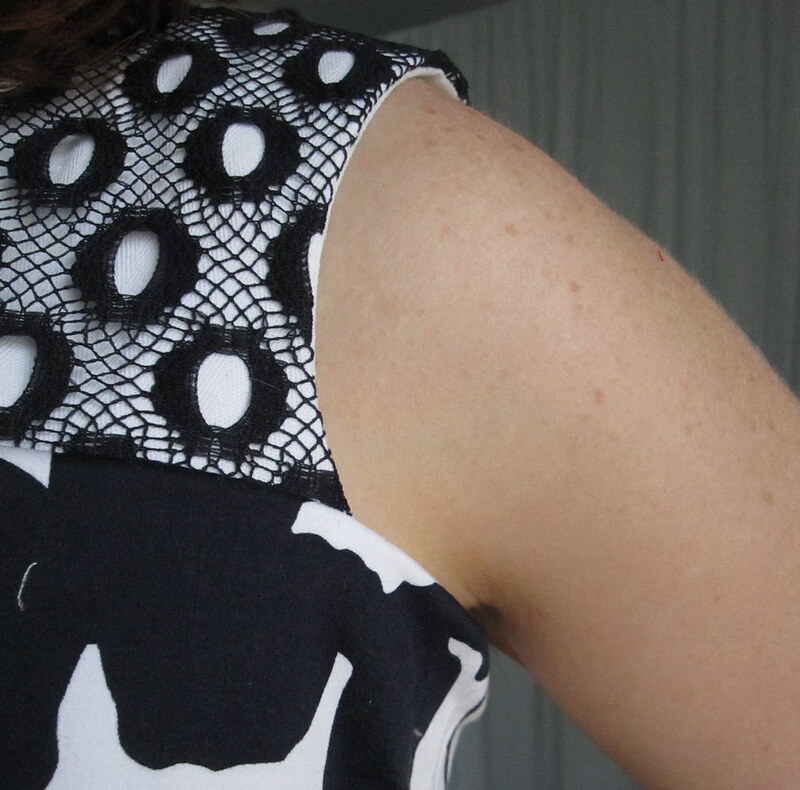 Also, when I sewed in the lining the front neckline started gaping. Not enough to do anything about, just enough to be annoying. And I'm not entirely convinced that I placed the front straps exactly symmetrically (or it could be my asymmetric body; one shoulder is slightly higher than the other but I ignore it in fitting. I am just not going to get into side-specific fitting). The right one could be shortened at CF and moved in a squidge. To make up a bit for my sloppiness with the upper bodice, I am quite proud of the perfect waist seam match at the zipper. It was important to get it right on this project because the two different fabrics meet there and any mismatch would be obvious. 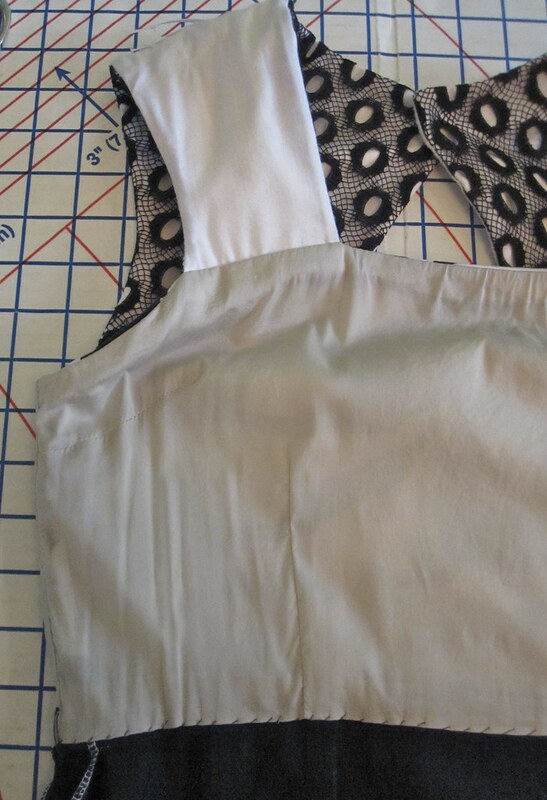 I lined only the bodice, hand stitching it to the waist seam. I interfaced the lining at the upper and zipper edges to give it the body needed to shape the neckline and stand up to the zipper. The skirt fabric is thick enough not to need lining, and given how hot it's been lately I don't need any extra fabric! 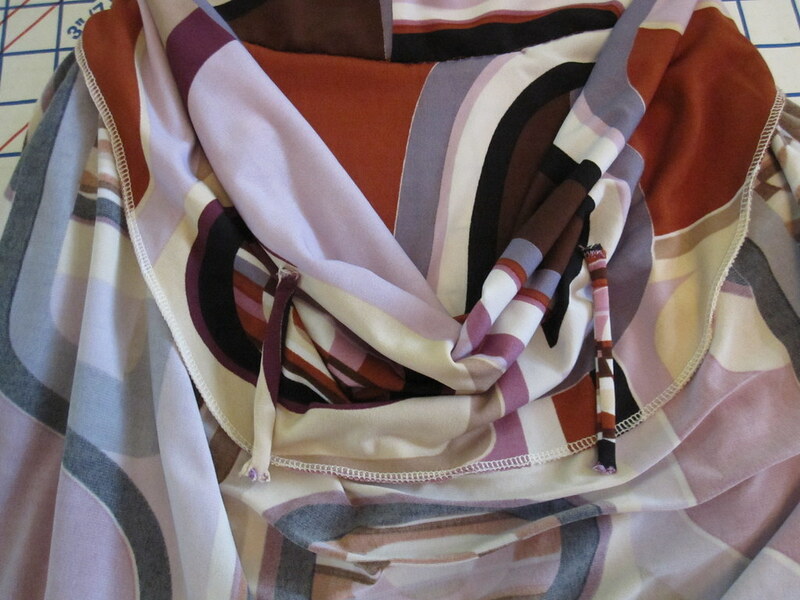 The skirt fabric is also stretchy enough to bike with the walking slit. As drafted, the hemline on this is quite short, which really never happens to me at 5'1". To get it my preferred length, I had to use a hem facing with a small seam allowance at the lower edge of the skirt. 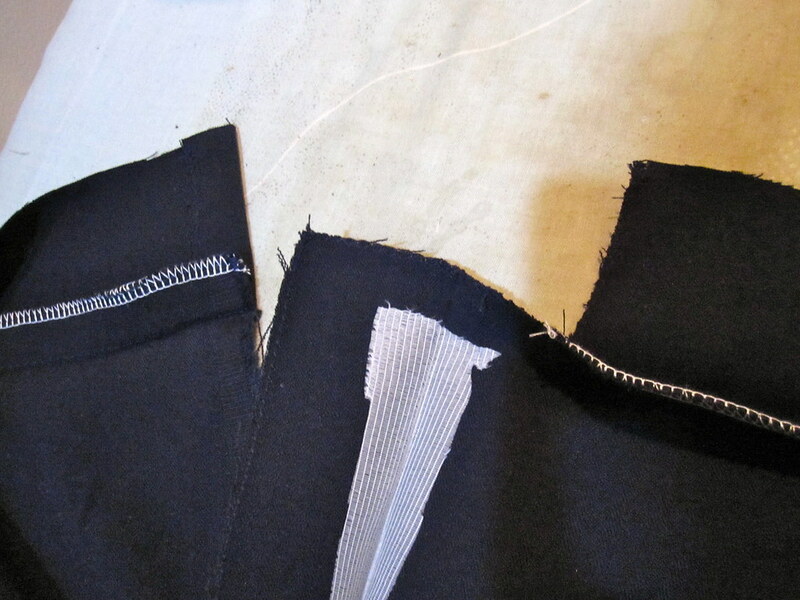 To reduce bulk at the walking slit, I ended the hem facing about half inch past where the folded-in edge of the slit would rest. Once the hem facing was in place and the hem was sewn (machine blind stitch), I folded the slit facing over the hem allowance and catch-stitched it in place. The final result is a neat finish without extra fabric to weigh down or distort the walking slit. The upper back bodice is meant to be closed with a button. I would have to significantly narrow the pattern for the edges to just meet for a button. I used a snap for a closure. I would like to find a decorative button to sew over the snap, but I didn't have anything in stash. The bad thing about colorblocking is that this dress used only tiny bits of several different fabrics, not enough to make me feel like it had any effect on the stash whatsoever! I'm not sure I would sew this pattern again, just because it's so distinctive. Also, it would need a lot of little alterations, adding up to a huge pain in the @ss, to fully live up to its potential--narrowing and possibly lowering the front neckline, narrowing the back neckline, properly drafting in a shaped lower armscye, redrafting the back upper bodice to prevent gape, narrowing the back upper bodice to use the button closure, etc. etc. etc.--which is another point against making it again. All that said, I really like this dress. It's flattering, the different fabrics and back interest are fun, and it plays into trends without being exactly what everyone else is wearing.